No. 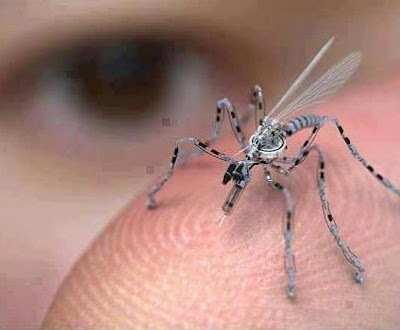 It's an insect spy drone for urban areas, already in production, funded by the US Government. It can be remotely controlled and is equipped with a camera and a microphone. It can land on you, and it may have the potential to take a DNA sample or leave RFID tracking nanotechnology on your skin. It can fly through an open window, or it can attach to your clothing until you take it in your home. Nu. Este o drona de spionaj tip insecta pentru zonele urbane, aflata deja in fabricatie, finantata de guvernul SUA. Poate fi dirijata prin telecomanda si este echipata cu camera si microfon. Poate sa se aseze pe tine, poate sa ia o mostra de ADN sau sa lase pe pielea ta un dispozitiv minuscul de urmarire prin satelit RFID (obtinut prin nanotehnologie). Poate sa intre prin fereastra deschisa sau se poate agata de hainele tale si astfel intra in casa ta.